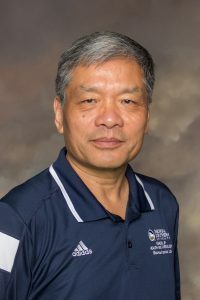 Dr. Li’s research is focused on the neuromuscular coordination of human postural control, especially postural stability during standing and walking. College experience is a small part of a life long learning process. 1. Li, .L., Wen, J., & Fu, W. (2014). Variability and stability of dynamic system applied to movement evaluation. Journal of Tianjin University of Sport, 29(1), 105-107. 2. Zhang, S., Holmes, M., & Li, L. (2014). Reliability of nerve function assessments for people with peripheral neuropathy. International Journal of Neuroscience, (0), 1-17. DOI: 10.3109/00207454.2014.920332. 3. Oyama, S., Yu, B., Blackburn, J. T., Padua, D. A., Li, L., & Myers, J. B. (2014). Improper Trunk Rotation Sequence Is Associated With Increased Maximal Shoulder External Rotation Angle and Shoulder Joint Force in High School Baseball Pitchers. The American Journal of Sports Medicine, DOI: 10.1177/0363546514536871. 4. Dobson, J. L., McMillan, J., & Li, L. (2014). Benefits of exercise intervention in reducing neuropathic pain. Frontiers in Cellular Neuroscience, 8, 102. DOI: 10.3389/fncel.2014.00102. 5. Li, L. (2014). The financial burden of physical inactivity. Journal for Sport and Health Science, 3(1), 58-59.